Heat oven to 350°F. In small bowl, beat 1/3 cup oil, the vinegar, brown sugar, garlic, 1 teaspoon salt and 1/2 teaspoon pepper with whisk. Arrange cherry tomatoes in single layer in ungreased rimmed large baking sheet. Drizzle olive oil mixture over tomatoes; toss to coat. Bake 40 to 45 minutes or until tomatoes are softened and brown in spots. Cool 15 minutes. Reserve 1 cup of the tomatoes; transfer remaining tomatoes into blender. Cover; blend on medium speed until slightly chunky. Transfer to 1-quart saucepan. Add reserved tomatoes and chopped basil. Reheat over low heat about 3 minutes or until hot. Meanwhile, between pieces of plastic wrap or waxed paper, place each chicken breast smooth side down; gently pound with flat side of meat mallet or rolling pin until about 1/4 inch thick. Season chicken breasts with 3/4 teaspoon of the salt and 1/2 teaspoon of the pepper. Place flour in shallow bowl; season with remaining 1/4 teaspoon salt and 1/4 teaspoon pepper. Mix with fork to distribute evenly. In another shallow bowl, beat eggs and water until frothy. Place bread crumbs on plate. Dip each chicken breast into flour mixture, then dip into egg mixture. Coat well with bread crumbs. In 12-inch skillet, heat 4 tablespoons of the oil over medium-high heat. Add 2 chicken breasts to oil; cook 3 to 4 minutes on each side or until golden brown. Transfer to same rimmed baking sheet. Add remaining 2 tablespoons oil to skillet. Add remaining chicken breasts to oil; cook 3 to 4 minutes on each side or until golden brown; transfer to same baking sheet. Top each breast with 1/3 cup tomato sauce and 2 slices mozzarella cheese. Bake 5 to 7 minutes or until chicken is no longer pink in center and cheese is melted. Garnish with Parmesan cheese and sliced basil. Serve extra sauce on the side. 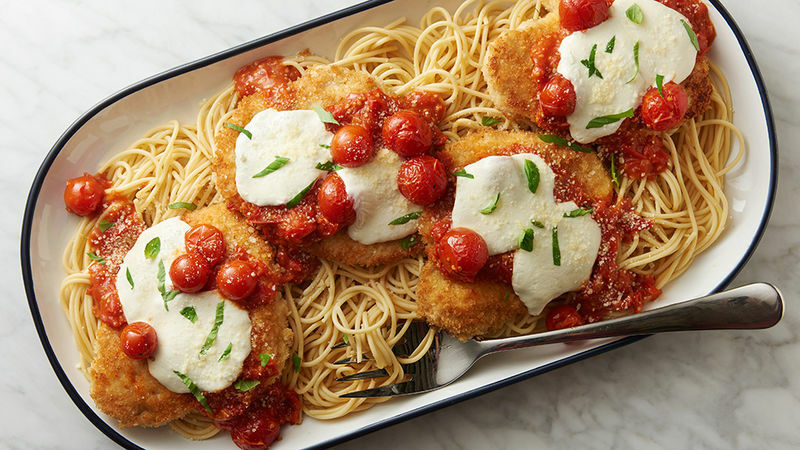 Spaghetti makes a natural side dish with chicken Parmesan. Spoon some of the extra sauce on top of the spaghetti to tie the whole dish together. To make this dish even easier, you can substitute the Roasted Cherry Tomato Sauce with 1 jar (25.5 oz) Muir Glen™ organic pasta sauce. Any variety will work.